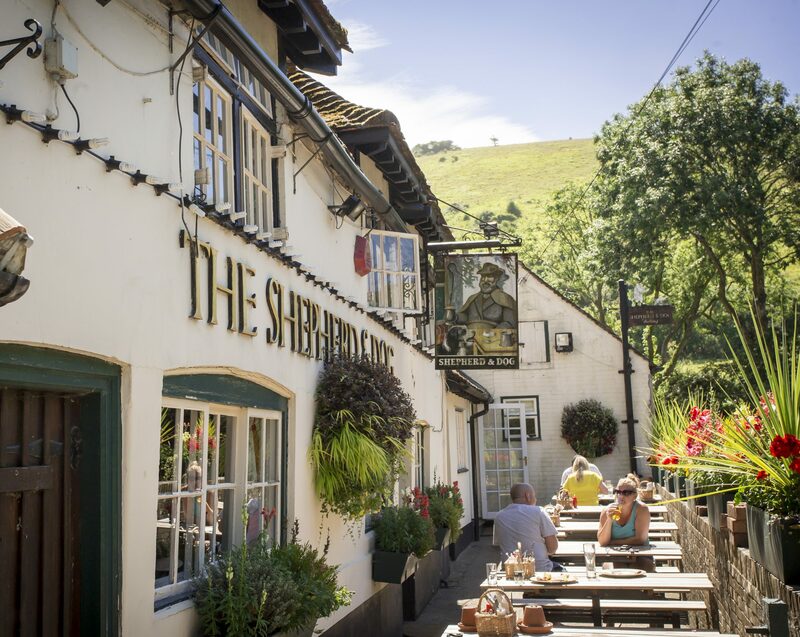 This is a reasonably easy circular walk of around 3 miles, starting and finishing at the pub, which offers wonderful views of the local countryside from the top of the escarpment that leads along to Devils Dyke. But beware, the climb up to the top is a bit of a challenge. -To start, as you look to the left of the pub garden there is a small track with bushes on both sides and a small concrete public footpath sign at the bottom. Take this track and then turn right when you get to the fence. – Continue forward until you reach a stile. Climb over the stile and up the steps. At the top of the steps you will come to another junction which will have a National Trust omega sign on the left hand side, take the path down and to the right. – Very soon you’ll come to a fork in the path, take the left upper fork. When you come to stile, cross over and follow the path until you come to a clearing with a trough in the middle. Go past the trough and continue up the path ahead. – Take the bottom path on the right keeping the wooden sign post on your left. At the end of the track you will come to another large trough. Go straight on keeping the trough on your left until you reach the main track. Turn up to the left, (do not take the small track to your immediate left, stay on the main track. – You should now be able to see the top of the old lime kiln on your right hand side which dates back to the Victorian era. Head towards this. 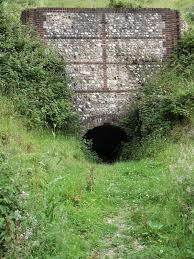 – After viewing the lime kiln continue up the main track. This is an old Bostal track which snakes up the hill. After the first right hand bend in the track you should be able to see a pylon ahead of you on the top of the hill, head towards this. The part of the track just before the pylon is quite steep. 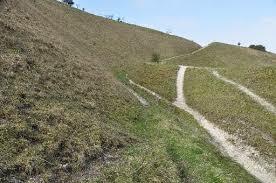 ( A ‘Bostal’ is a an old Sussex name for a track up the side of a steep hill). – When you have passed a pylon you will see a metal gate at the top, take the sunken track on your left immediately before this gate. Take this track. – When you emerge from the sunken track continue through the gate ahead and towards the wooden signpost which is by the fence on your right. 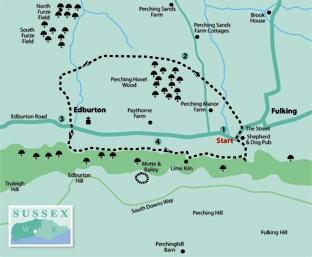 This path is now part of the South Downs Way which runs from Eastbourne to Chichester. – If you look ahead of you along the South Downs Way there is a small wooden fence which contains a Bronze Age burial mound. Once you have viewed the burial mound walk back down to the wooden waymarker. – Take the sunken track that leads down the hill, and continue forward. After about 220yds (200m) turn left at another wooden waymarker post. Follow the track round to the left. – Head down towards the trees and you should see the National Trust sign which was near the beginning of the walk. Take the right hand track and stick to the fence line, back down the steps and over the stile. – Continue along the path until you can see the pub garden on your left, take the track that runs alongside the garden down to the car park. 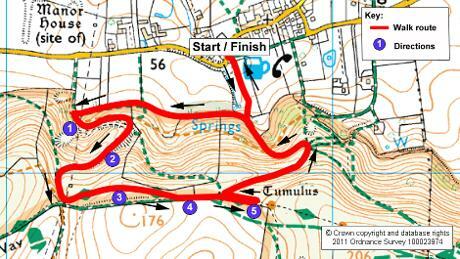 1 – From the lay-by just west of the pub, pass the spring outlet, turning North East up The Street. At the top of the hill cross the road to the John Ruskin water fountain memorial. A little to the right, pass through a gate on to the village green. Walk to the right corner then pass through a gate to a field-edge. Follow the path, half-left, crossing a mid-fence stile and continuing half-right to the field corner and then on to a track. Go left to a path sign and take a half-right line across a field to a concrete track. From the track cross a stile in the left fence, 50 yards right of a pylon, continuing half-right to the field corner and crossing a stile and bridge beside Perching Hovel Wood. 2 – Turn left beside the wood, coming to a bridge and stile; continue ahead along the next left field-edge. At the field boundary cross a stile and bridge, keeping direction on a bridleway to a track and four-way junction. Take a few paces left, climb a low bank on the right, follow the left hedgeline to a field corner. Go left through hedgerow, cross a bridge, turning right to arrive beside a cottage. Walk along the left fence for 150 yards, going left through hedgerow. Do not take a right turn but continue up the left edge, going left through hedgerow in 150 yards, passing an industrial unit and turning right along a driveway. 3 – At Edburton Road take a few paces left, crossing to a public footpath on a surfaced drive leading to a parking area, near commercial buildings. Climb the bank, right, on slippery steps, beside a fence, turning left and crossing on to open access land. In 20 yards take a trodden, unsigned permissive path, going left along the edge of the woodland. The northern scarp face of the Downs looms to the right, as the path follows the rise and fall of the coombes. In a quarter of a mile a bridleway joins from the left, beside a copse – keep direction ahead. Follow the left hedgeline for a further quarter of a mile, with sloping meadow to the right, to join a footpath coming from the left. Divert right, crossing a stile behind a cattle trough. 4 – Climb left up a bank, continuing along the hillside, taking no side turnings, and descending through scrub to a track. Go right for 50 yards taking a signed left turning up a bank. Note further up the track the reconstructed flint-built lime-burning kiln, evidence of earlier local industry. Keep direction for one third of a mile (take no side turnings) to a three-way junction, joining a wide descending path. Turn full-left on the descending path, cross a stile in 100 yards and continue for 200 yards, diverting half-left, through hedgerow, to the car park beside the Shepherd And Dog pub.